Those of you who know our family or follow me know that I LOVE field trips in our "homeschool". I feel like through hands on "experiences" we learn so much. 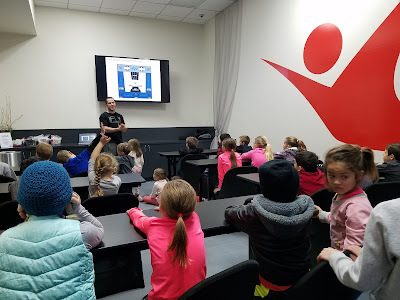 We make sure to squeeze lots of field trips in with our homeschooling. 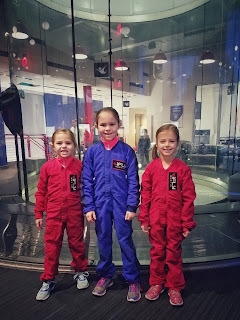 Our first field trip of the year came last Friday when we visited iFly in Austin. IFly offers indoor skydiving. "How in the world do you skydive indoors? ", you may ask. In indoor skydiving, you get the simulation of true freefall conditions in a vertical wind tunnel. When registering for this field trip, we indicated whether we wanted to register just for the lecture and lab and demonstrations or whether we also wanted to "fly." 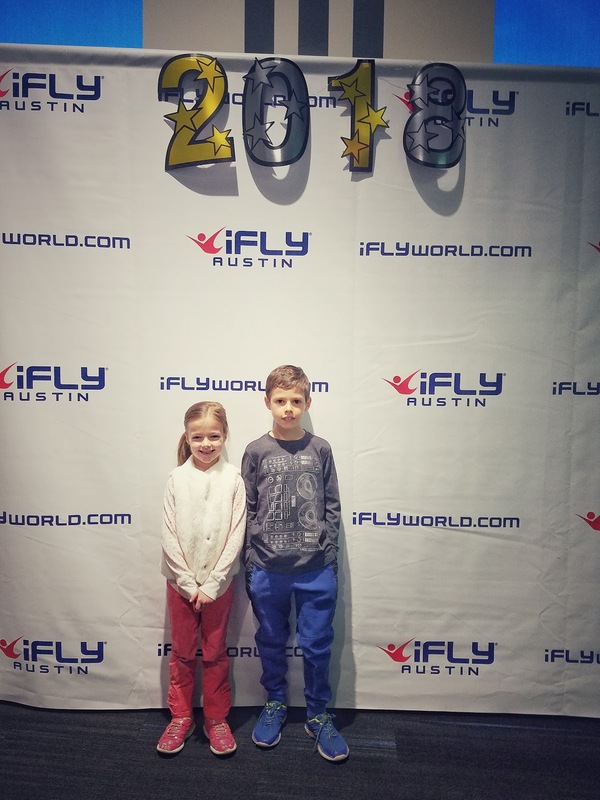 Both Abbey and Luke said they definitely did not want to "fly." This didn't surprise me though, because Luke, who was previously pretty fearless has become way more careful and calculating before he embarks on activities. And I am completely fine with that. Abbey is also becoming a bit more careful. I also told both of them that if they decided to fly when we were there, they could do so. When we arrived for our field trip, we went straight up to the tunnel and watched some experts demonstrate for us. They did some really neat tricks and are extremely talented at skydiving. What a fun job to be able to do that every day, right? Below are some videos of the experts flying prior to our class beginning. After watching them do all of the awesome tricks, Abbey was ready to fly! But first, we attended a little lecture for some learning. A vertical wind tunnel has fans at the top to draw air through the flight chamber and then push it back down the sides through Return Air Towers (RATs). The air is ‘turned’ from the RATs into the bottom of the tunnel (plenum) and back up toward the flight chamber through an inlet contractor. The inlet contractor reduces the space the air can travel in, thus compressing and speeding up the air before it reenters the flight chamber. The result: a smooth column of air that enables you to fly. The kids learned about engineering and discussed different ways the wind tunnels are used. (The tunnels are used to copy the actions of an object in flight. Researchers use wind tunnels to learn more about how an aircraft will fly. NASA uses wind tunnels to test scale models of aircraft and spacecraft. Some wind tunnels are big enough to hold full-size versions of vehicles--they can test how aerodynamic a vehicle is). The kids learned about force and how changing their body positioning might impact their flight. Overall, it was a great S.T.E.A.M learning opportunity. The kids also got to guess what might happen when they tossed water into the tunnel. Then, they watched them toss water in the tunnel. The water from the container, once poured, turned into millions of little droplets, which floated all around. In addition, the kids predicted which balls would fall fastest (wiffle ball, basketball, and a light playground ball). They thoroughly enjoyed watching all of those demonstrations and taking guesses, learning something along the way. Anyway--enough about my experience. you can imagine that when Abbey said she wanted to do it I was a little bit nervous for her. But I was excited for her to get to experience something so awesome. Abbey and two of her friends who also wanted to fly. All suited up and ready to fly! At first, the kids were flying one at a time with the instructors. But eventually, due to the size of our group, they began taking two kids at a time. Abbey got to be in the tunnel with one of her good friends, Bella. 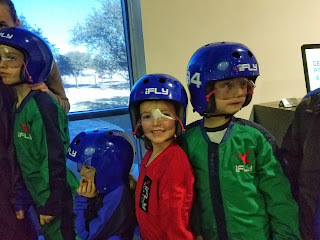 It was so much fun to watch them experience flying for the first time. 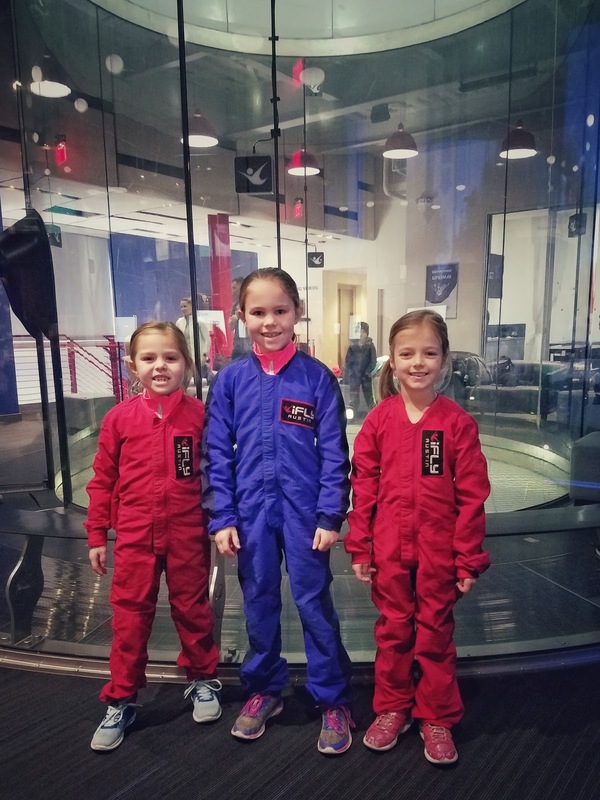 Here is the video that iFly took of the girls flying. I like this version because you can see the reactions of Luke, me and Abbey's good friends on the other side of the glass. And here is the one that I took (you can hear all the commentary). As you can hear from that video, I really thought Abbey was scared (based on her facial expression). But, she told me afterwards that she LOVED the experience and wants to do it again. She was so glad that she tried it! Luke was just as happy watching her and many of his friends fly. It was a successful first field trip of 2018.